On May 2012, history was created when the world’s most expensive burger was unveiled by the iconic New York City based restaurant, Serendipity 3. The succulent dessert item, which boasted of a whopping price tag of $295, was rightfully crowned as the priciest burger in the world by the Guinness Book of World Records. The mind boggling price tag commanded by the burger is due to the fact that it’s loaded with a wide ranging variety of rare and expensive ingredients. The exotic burger's main ingredient consists of Japanese Waygu beef infused with ten herb white truffle butter. The exorbitantly priced food item also sports a layer of extra creamy cheddar cheese, cave aged for eighteen months and hand made by Surrey based British cheese maker James Montgomery. 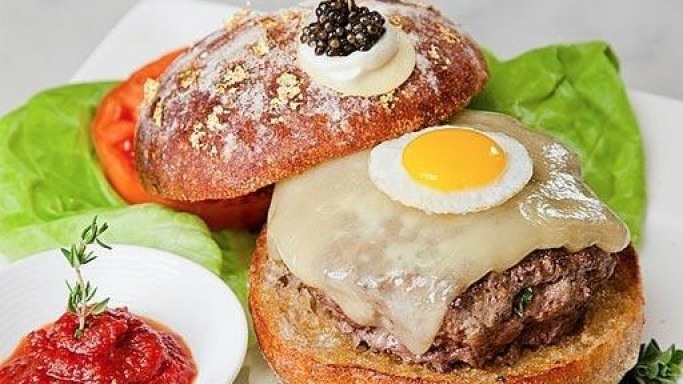 Other items making up the burger include shaved black truffles, one fried quail egg served on a milky white truffle buttered Campagna roll topped with crème fraiche, blini, Paramount Kaluga caviar and a dash of Salish Alderwood smoked Pacific sea salt. Interested parties’ keen to savor the exotic dish had to reserve a table 48 hours in advance since the burger was available for a very limited amount of time. Several well-heeled New Yorkers grabbed the opportunity to gorge on the record breaking burger. The icing on the cake was provided by the "Fleur de Lis" toothpick embedded in the burger. The pure gold and diamond encrusted toothpick has been designed by renowned American jeweler Euphoria and perfectly topped off the once in a lifetime dining experience. However it must be noted that all this conspicuous bling did not go waste and served a very noble cause. News reports indicate that all the profits generated from the sale of the record breaking burger was donated to the Bower Mission, a New York based charity serving homeless and hungry people since 1979. However this is not the first time the New York based restaurant is selling such an extravagant and expensive food item. Serendipity 3 has gained a lot of popularity with the American public for their expensive sundaes and hot dogs, which has been savored in the past by high profile Hollywood celebrities of the likes of Grace Kelly and Marilyn Monroe.